Why not glory to Arstotzka, hm?? Is blue yoshi the best yoshi? I'm Australian, so it's unusual for me to not use the c word. Can I say it on dashnet or will I get in trouble? What do you think of forum games? What about MY forum games? Which do you believe to be my best forum game(s)? What about the best forum game in dashnet? What would that be to you? Cookies are the best things in the world, aren't they?? You won't get in trouble for saying pretty much any word here. Saying the n word could get you in trouble, but I guess that's mostly to do with what context it is used. What does that make a cookie pizza? Is bread the ultimate form of both cookie and pizza? Are you happy or sad that Dilk was banned? Are you a patient of depression? PAIN AU CHOCOLAT IS THE ULTIMATE COOKIE-BREAD-PIZZA-LLAMA!!! 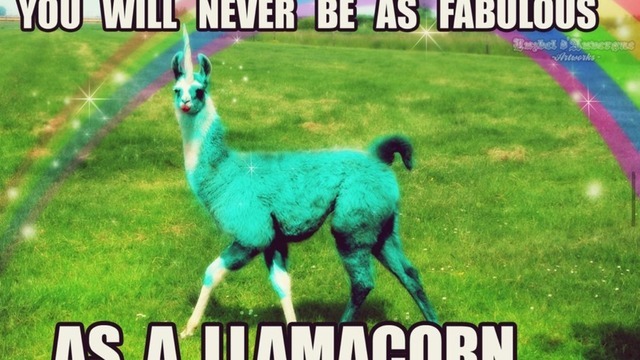 "You will never be as fabulous as a llamacorn"
No llamas are def not cool. Well, except gravity llamas. Gravity llama is the best game ever made. How many notifications? And at what point do you plan to stop? Do you hate bainrstomr's forum games? What do you think of signatures still (kinda) having the old theme? Didn't care much, but we back to normal now.